I got started while I was in the Navy. At the time if you passed the course to become an aircrew survival equipment man or a parachute rigger the reward was a parachute jump. I served in the Navy for four years as a parachute rigger. I packed parachutes and I did my first jump on the Navy’s dime in Lake Hurst, New Jersey. 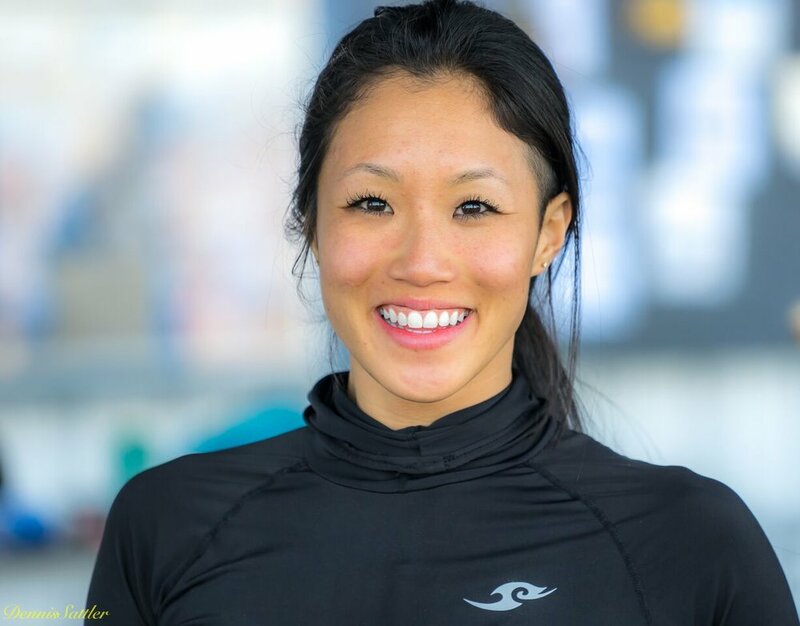 I started sport skydiving a year after my first jump. That was in 1972 in Waynesboro, Virginia. I think it was called Skydive Waynesboro or something like that. It’s not there anymore. The guy running it was Rudi Krenz. I think he’s out in New Mexico now. Long story short, I started in 1972 but I took a couple breaks. 2) How many jumps do you have? 3) So what’s the story behind this iconic photo? I competed on an 8 way team called the Sky Scammers in 1976 in Coolidge, Arizona. There was a British guy and a couple of Australians. I had been living in North Carolina and jumping in Raeford and Deland at the time. I had the opportunity to go to Arizona so I went. We decided we were going to drive out there. We slept and drove and slept and drove across the country. I spent most of my money getting out there to include selling my altimeter. In AZ, I ran into Rob Coplus who I had met earlier in Zephyr Hills. He said, “do you want to be on an 8-way team.” I said, “sure man.” The competition took place during the Coolidge Boogie. At the time, it was well known and well attended. The drop-zone had a four engine DC-4. In the 70s, there weren’t all of these organized classes and training camps like you see now. In order to learn and progress you had to go to other drop-zones where things were happening and the sport was being advanced. There were maybe five or six drop-zones in the U.S. that really had experienced people. You would go there and jump out of bigger airplanes. It was really a fun experience jumping and seeing how those guys organized 8 way. Harrison (r) at Virginia Skydiving Center. 4) Where did you go next? After that, Rob and a couple other guys invited me to come to California to a place called Pope Valley Parachute Ranch. It was one of the premier drop zones in the country in the late 1970s. It was even the training destination for Mirror Image, the US 8-way team which included BJ Worth. I asked Rob, “can you find any work?” He said, “yeah, there’s a winery and you can work on the drop-zone.” So we drove a yellow school bus from Coolidge, AZ through the Grand Canyon, Las Vegas and Lake Tahoe on our way out to Pope Valley. It was a really crazy trip. Pope Valley is located in the Napa Valley. The drop-zone was a little ranch. We had an airstrip, a pool, a clubhouse with a bar, a little hotel and a small campground. I worked there and jumped with a guy named Bill Dawes—owner of the Lodi parachute center. The who’s who of skydiving came from all over the world to jump at Pope Valley. 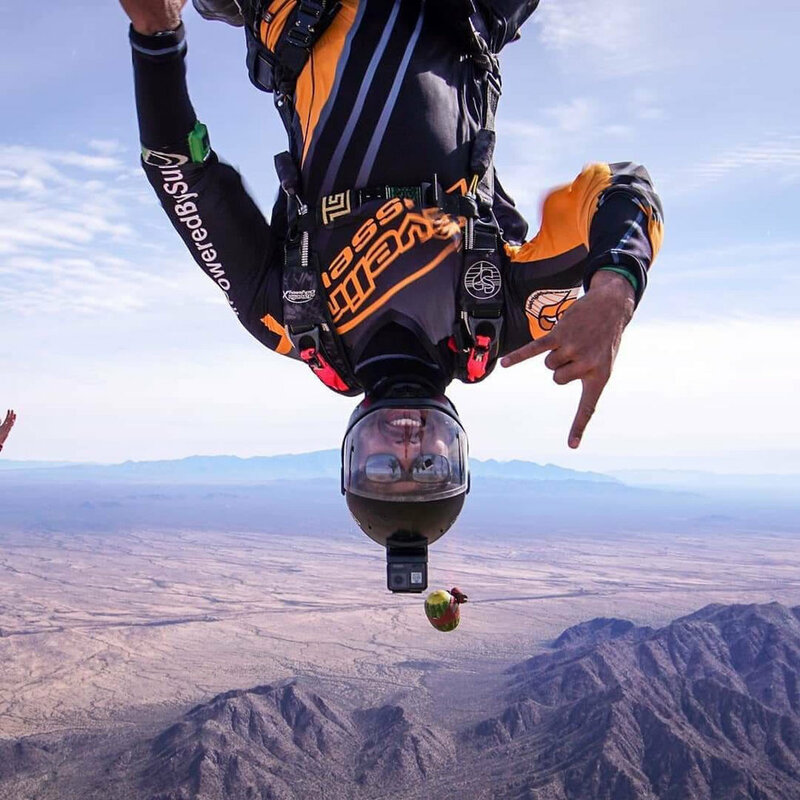 It included folks like Tommy Piras, a world class skydiver who made over 10,000+ jumps and won several championships before passing away in 1992 in an skydiving accident. Tommy went on to win the world meet in 4 way that year. He was also an excellent organizer. He invited me to come to AZ to jump with him but I didn’t go. Then there was Ernie Butler, a Special Forces veteran who became paralyzed below the waist in a skydiving accident in 1995. In the 70s, Ernie was captain of one the U.S. teams. I was in Pope Valley for about a year. Then the ranch closed down and everyone moved onto Skydive Perris and Skydive Elsinore. I was supposed to go to Perris Rally at Skydive Perris but I didn’t. My timing was awful because a few years after that, Skydive Perris had surpassed Pope Valley’s reputation for skilled organizers and world class skydiving. After that, I was in Tahoe for seven years. I made about three jumps in Carson City, Nevada and a few demo jumps here and there. Otherwise, I was just working and burned out from skydiving. I wanted to see if I could get some life skills. After I left Tahoe, I came to Virginia and helped take care of my mother. Then I got married and had a son and a couple of stepchildren. In 1996, my son and I went to see the Mission Impossible film. The action scenes unearthed that old feeling. I said, “man, that’s what I need to do, I need to get back into skydiving again.” So I did. This time I went to Skydive Orange in Orange, VA. I did a lot of relative work (RW) at Orange. I ended up going to Nationals with a 4way team. We placed in the middle of the pack. It was pretty exciting; I got to meet a lot of really good coaches including guys like Niklas Hemlin from Arizona Airspeed, Joey Jones from Generation FX. I came back and was supposed to start a different team but that didn’t come together. It did kind of bum me out. I decided to take another sabbatical and focus on raising my son. I took more time off and gave it my best shot to make sure he had a good foundation. He grew up on the drop zone for the most part. And he turned out good. I decided to get back into skydiving around five years ago. I’ve been skydiving since then. I have noticed a few differences. My body had just changed, you know. I wasn’t in as good condition. I tried but old aches and pains that I never paid attention to became big things. I’m still flying though. In 1972, I jumped a 7TU, a round parachute with an Army surplus container. In fact, I actually purchased my gear from a former member of the Shooting Stars, the Navy demonstration team). I went from that to a Para-Commander, another round parachute, which I jumped for a long time. I had just gotten out of the Navy and I was on a budget. I didn’t take the organized approach to skydiving by getting a good job and saving money and then skydiving. I just went skydiving. So I stuck with the Para-Commander. I finally got a StratoStar. I bought it used from a guy who did demo jumps at Kings Dominion from a drop-zone out of West Point, Virginia. His name was Tommy. It had rings and ropes on it. It was one of the first deployment systems on square parachutes. This was before sliders. If you didn’t pack it right, it was a malfunction waiting to happen. But being a parachute rigger I was very meticulous. I saw Tommy a little while back at Carol Clay’s memorial. I hadn’t seen him for—must have been 30 years. Nowadays, I’m jumping a Javelin with a Sabre 1 170. I was jumping that when I had my accident. I had to send it in but they fixed it. Harrison (2nd from l) poses with Team Blackstar skydivers in Virginia. My accident was in the late 90s at Skydive Virgina, a drop-zone in Louisa, Virginia. They were doing a lot of relative work so I decided to start skydiving there. We were jumping a King Air at the time and the scene was mostly local jumpers—a lot of folks I had jumped with before. On the day of my accident, I did an 8-way skydive. The jump went great. At break-off we all tracked away. I opened and checked my airspace. I entered the pattern and got on final. The landing area was a narrow strip of grass sandwiched between a taxi-way and a runway which ran parallel to each other. You couldn’t cross either of those underneath 1,000 ft. The end result was a long final for most jumpers. That day there was also a newer skydiver testing out a new canopy. I was checking my airspace. I could see all but one canopy. I wasn’t too worried because I knew nobody was below me. So I thought, I’m obviously the lowest person so they should see me coming in [Editor’s Note: In skydiving the lowest jumper always has the right-of-way]. It turns out that the missing canopy was to my right and up out of my field of vision. The jumper saw me below but she had another problem: she was going to overshoot the landing area. So she did a 360 degree turn on final. Unfortunately for me, canopies lose altitude when they turn. As she came out of the turn, she saw she was going to run into the back of my canopy. So she took her hands off her toggles and put them on her cutaway handles. She hit the back of my canopy and bounced off. I turned around when I felt the impact. This time, she slid down the back of my canopy; her foot unfortunately got caught in my brake line. My canopy deflated and wrapped up so fast it was hard to believe. It was really hard to fathom. I said, “man, I got to get this thing off of her foot.” Her canopy deflated and then we were spinning. I finally got it off of her foot at about 500 ft. I was kicking hard trying to get my line twists out. As one of the line twists came out the canopy tilted me so that I could see the ground. I saw that I was out of time. I pulled my reserve ripcord and tried to relax. About two seconds later, still spinning I hit the roof of the hangar. I said, wow, that wasn’t too bad. I had thought I was good as dead. Just as I said that I started going through the roof. My right leg got caught in the hole that I made and it slammed me into the side of the wall of the hangar. I got my foot loose. My canopy was still stuck on the outside of the hangar, suspending me 9 inches off of the cement floor. I was extremely fortunate! I didn’t have any major injuries apart from a partially torn ACL and a cracked heel. The doctors put a full length cast on my leg. The swelling was so bad they couldn’t immediately tell what was wrong with it. Eight weeks later they took the cast off and they sent me to physical therapy for the ACL tear. They told me that as long as it didn’t cause significant pain or disability, I was good to go. The other jumper was fine; her canopy re-inflated and she had a great landing. 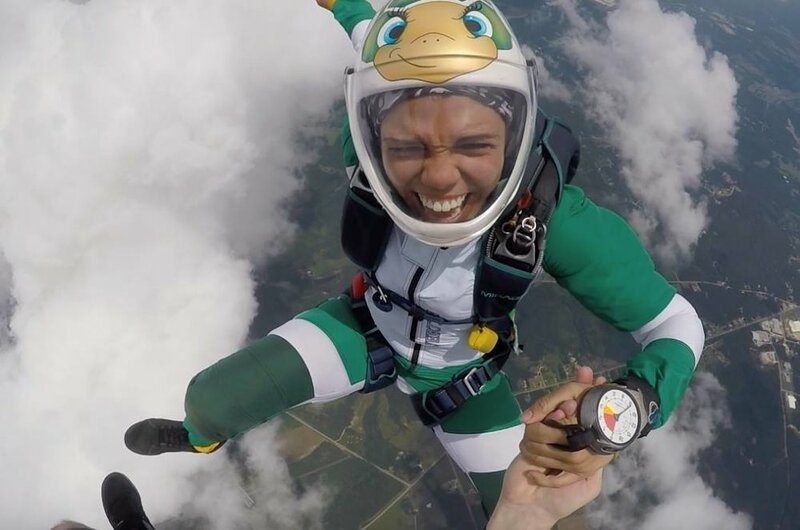 7) What type of skydiving do you enjoy? I also learned CRW in Suffolk and West Point and also Pope Valley. We would do it after 4 way training jumps. It was a little crazy. We were all learning back then. And to learn new techniques you had to travel to the bigger drop-zones where skydivers were pushing boundaries in the sport. Most drop-zones only had Cessnas. Every once in a while you’d get two Cessnas and put together a formation load. West Point, VA usually had bigger airplanes and really experienced skydives so I gravitated towards there after I came back to the east coast. Mostly sports and chopping wood. I grew up in Staunton, VA. I used to go for summer vacations over in MacDall County in Virginia. We would hunt. My grandfather lived over there. We’d chop wood for the winter, haul water, do gardening, yardwork. I was the only boy but I had cousins who would come. We would hunt deer and bears and snakes and squirrels. My grandfather had about 66 acres which we just sold not to long ago. 9) Have you participated in any record jumps? If so, what were they? The first VA state record was a 20 way. I was on that. We did that out of a SkyVan at West Point, VA. One of my goals was to be on a 100 way. I went to Cross Keys, New Jersey where Joe Trinko, a former Golden Knight, was the organizer. He put together everyone on the drop-zone—including free flyers. I got in. We got the record. I had a malfunction on that jump too. That was back in the early 2000s. It’s freedom to me. It’s being above all of your problems; and the joy that you see on each other’s faces when you’re doing it and having fun. It’s a lot of good connections. 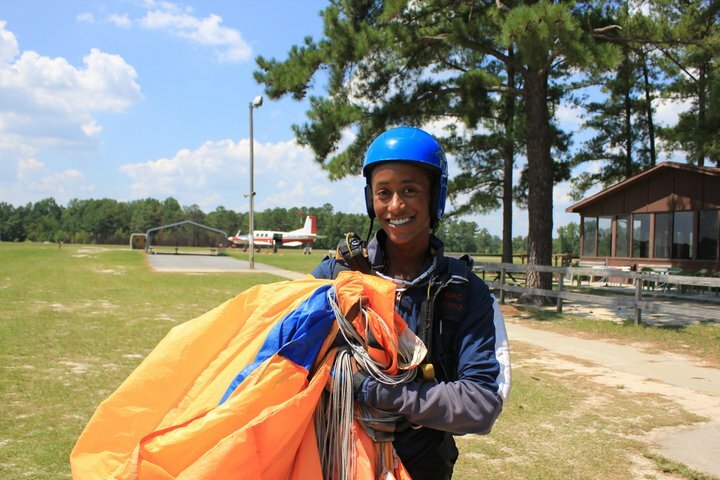 11) Over the years have you had the opportunity to jump with other African-American skydivers? 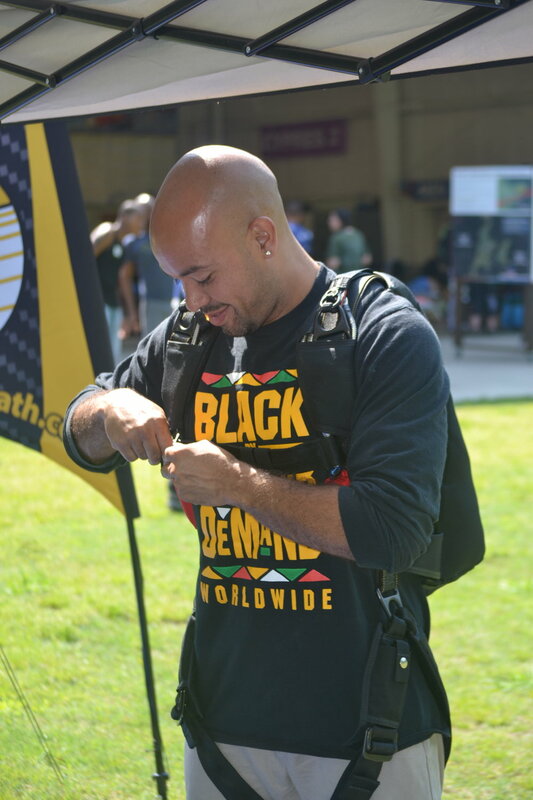 When I started jumping I didn’t know any other Black skydivers. I knew a Black parachute rigger in the Navy in New Jersey back in the 1970s but I never had the opportunity to jump with him. It was a good while before I ran into any Black skydivers after that. I ran into another guy at the Herd Boogie in Pottstown Pennsylvania but I don’t remember his name. We jumped together out of a SkyVan. I had my 20 way patch by then. Back in those days that meant you had arrived—when you got your 20 way patch. 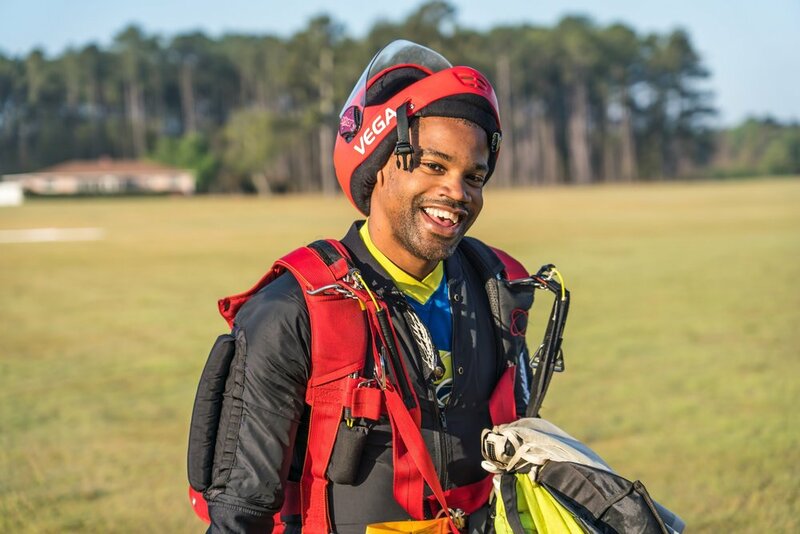 Then I ran into a Black skydiver who was also a Golden Knight and had his own airplane. He was at the Hall of Fame dinner in North Carolina. I was there because they were inducting a friend I used to jump with, Chris Needles. Later on when they opened up Buckingham, VA there were some brothers who came out, local guys, who used to jump. There was a reverend, Jim Macintosh, who until recently, was still jumping periodically. He was an engineer with UVA, also a reverend. He would come out maybe twice a month. 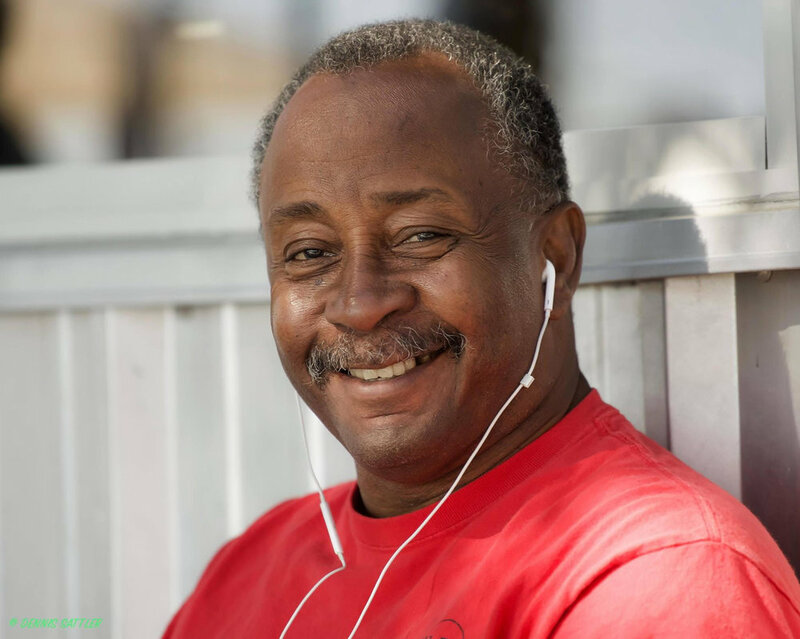 Frank Halcromb, who recently passed, was on the west coast; he was in the Army too. Then as in now, a lot of us are military veterans. 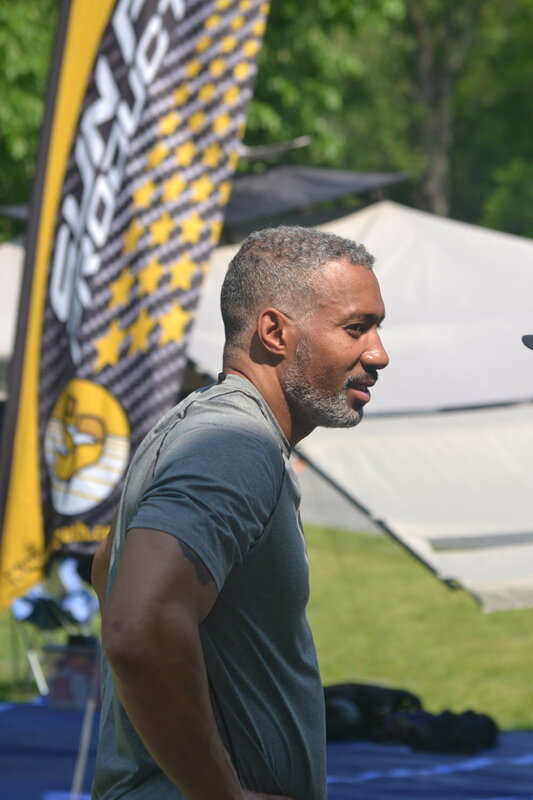 Recently, I drove down to Skydive Paraclete in North Carolina to attend the 2018 Team Blackstar meetup. 12) What is the most challenging thing you’ve ever done as a skydiver? The most challenging was coming back after the accident—or maybe the 100 way. I just drove up to Cross Keys by myself. Previously, I’d been on a couple of big way attempts in Virginia so there some people knew that I could perform okay. So, they let me on the skydive. It was kind of a risk going up there without having been to any camps and getting to know the guy. It took about five attempts for us to get the record.